Japan Kasumis are freshwater pearls from one specific lake not far from Tokyo, Lake Kasumi Ga Ura. It is actually a wide tributary of a river delta flowing into the Pacific Ocean, much like our Fleuve St-Laurent flows into the Atlantic. Production is extremely small; therefore, supply is limited and prices high. In the past decade, "Kasumi type" Chinese pearls have come on the market, creating some confusion and even dishonesty. So today, we're shopping Japanese Kasumis and Chinese Kasumi look-alike pearls. A few dealers and jewellers offer Japanese Kasumis; many sell the Chinese product. The key to wise buying is to know the difference before you dip into your purse, so today we're peering into the Passage's windows, which hold both. Left: Deep coppery purple 11.9mm x 13mm pendant; madonna, those overtones! The 14k gold bail is set with tiny diamonds. Price, $540. Centre: Akoya keshi and 11mm to 12.5mm bauble 20-inch necklace; price, $918. Right: "Appolonia" pearl and 14k gold chain 18-inch necklace; price, $1, 800. This piece shows the characteristic shape and iridescent overtones. The price should tip you off, and it's not even a high-quality Chinese pearl. Further in the listing, the seller fesses up, at least identifying country of origin, but it still galls me that the pearl is listed as "genuine Kasumi". 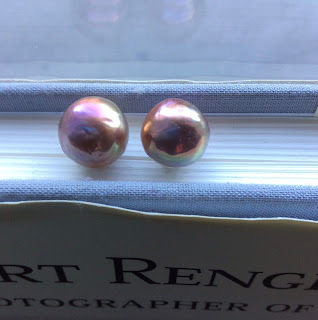 Even jewellers will misrepresent pearls, intentionally or not—and I have a story. Last December, at a local craft show, I bought these 14mm studs at a young jeweller's kiosk. The studs look even better than the photo below, with shimmering overtones of green and gold over a deep rose body colour. They were tagged "perla Kasumiga"; my antennae quivered. When I questioned what this use of "Kasumiga" meant, she said, "This is the brand name the dealer uses", and "The Chinese have cultivated the same mussel hybrid. The Japanese lake is too polluted." 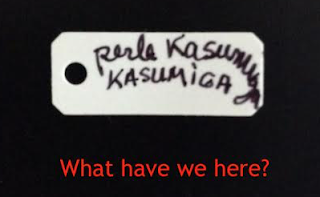 She is correct in saying that "Kasumiga" is a registered trademark name; it is also used to describe, as Sarah wrote, "all matter of pearls, mostly Chinese, in almost any colour or size, nucleated or not. The brand does not mean they are from the Japanese lake." It's like "Champagne", which refers to wine from one specific region in France, but also has become a generic descriptor in everyday speech. The jeweller also said, "Genetically speaking, these are pearls from Lake Kasumi ga Ura, even though they have been cultivated in China". Her statement could cause a customer to believe the Chinese product is identical—and therefore equally valuable. I would not describe them as "Kasumis". 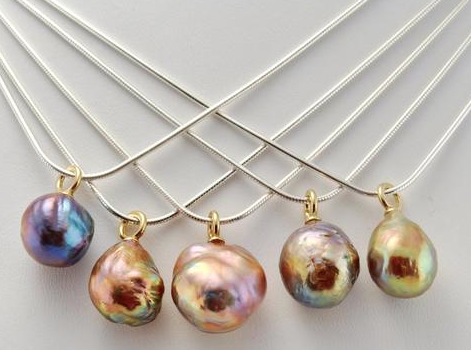 Conscientious vendors use the description "Chinese freshwater ripple pearls". The seller should provide the crucial information, country of origin. I thought the local jeweller was lax, possibly from inexperience. Still, caveat emptor. Both Kojima Company and Pacific Pearls do not use the K-word for any pearls except from Lake Kasumi Ga Ura, and refer to them as Japan Kasumi. Do not depend on price to indicate provenance; I have seen steep price tags on pearls sold as "genuine Kasumis" that are in fact Chinese. The studs cost $CDN 85 (tax included), a reasonable price for big, colourful, lustrous CFWS. Which should you choose? It depends on your budget and the quality of the pearl. 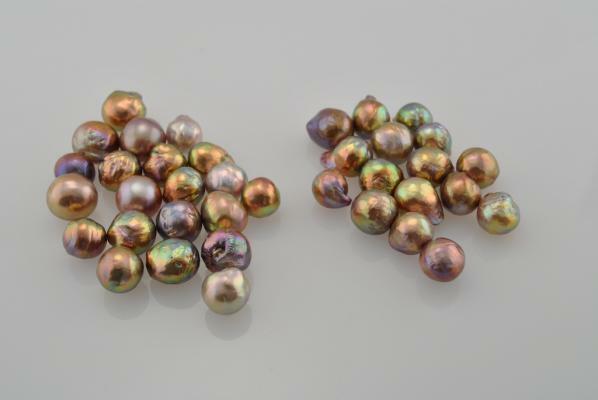 The photo above shows that Chinese ripple pearls are available in stunning colours, too—so by no means count them out. However, your Chinese pearls may be dyed to achieve those intense colours, and that treatment should be disclosed. For a pearl of similar lustre, colour and size, the Chinese product should be markedly cheaper. 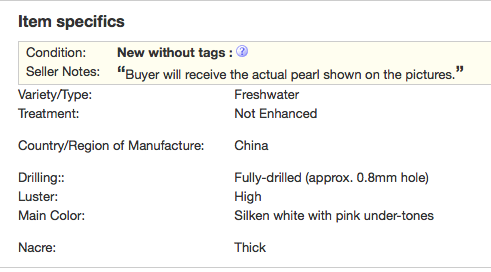 Kojima Company sell both Chinese ripple pearls and Japan Kasumis—and you can trust their description. With other vendors, as soon as you see "Kasumi" (or Kasumi used as an adjective, such as "Kasumi-type") without country of origin, or "Kasumiga", your caution light should pop on. Wearing a Japan Kasumi is to wear an historically-prized pearl from "the body of water beyond the mist", as its name translates from Japanese. I would vastly prefer to support the Japanese farmers, just as I prefer to buy goods manufactured in countries who have developed proprietary practices and are deeply committed to the natural environment that forms them. So I will not even call my new CFW earrings "Kasumi look-alikes". They are Chinese ripple pearls, point final. Owning a good Chinese ripple pearl is still to wear a pearl brimming with character. You know how I always say every woman looks more beautiful in pearls? In these exotic pearls of ethereal colours, she also looks more interesting. * The Japan Kasumis are on the left. As I'm sitting here at home nursing a ripe winter cold, your pearl post comes up and I feel ...ahhhhhhh...now that's what I need. So much beauty. And backed by solid information. Many thanks for the time and energy that you put into this. I love your jewelry posts. Since you are so knowledgeable about pearls and have traveled to India , what is your opinion on Hyderabadi pearls? Jay: Hyderabad is a •trade centre• for selling pearls, either to the trade or retail. No pearls are native to the city. Most are Chinese. Pearls do not come from Hyderabad any more than diamonds come from Amsterdam. Oh ok thank you. I was given a gift, a choker of button pearls from Hyderabad. Chokers don't suit me at all so I've never worn them. Maybe I should look at all your reno projects to find something. Jay: Whether the pearls are worth a reno depends on the condition of the pearl (are they lustrous, without patchy, dull areas?) Are the backs of the coins in as good condition as the front? And, do you like the size and colour?